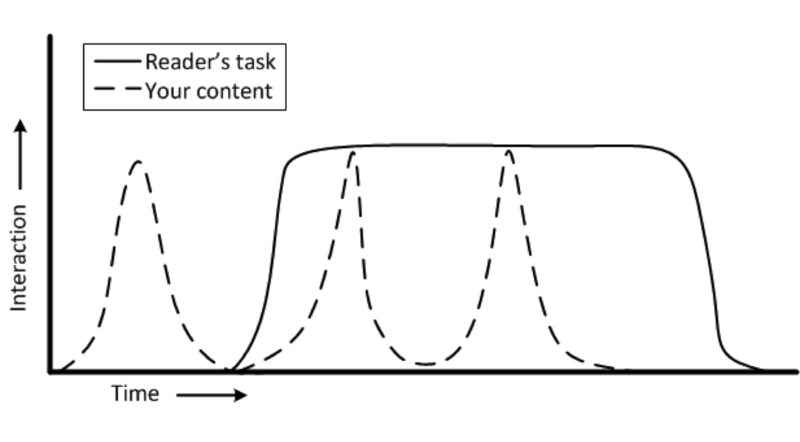 The figure shows how interactions of this type might relate to a reader’s task. Because, as Redish  says, readers will read “until they’ve met their need,” readers will spend as little time in the site as they need interacting with the content. Once they have been reminded of the information they need, they will return to their original task. Topic design principles needed to serve this interaction include making the content easy to find, navigate, and read. Visible headings and short “bites” and “snacks” of information  are well suited to such a goal. However, my research in developer documentation says that these guidelines depend on the specific context–a reminder to know your audience. Knowing your audience is also key to using the terms they will recognize. Website-based metrics are not particularly helpful in determining the quality of the readers’ interactions. A good time-on-page value, for example, might be short–to the point of appearing to be a bounce, or it might be long. The number of times a page is viewed also has an ambiguous meaning when it comes to understanding the quality of the readers’ interactions.